upelo Community Theatre offers a variety of programs in addition to our regular season performances. In fulfilling our mission statement of promoting the dramatic arts, we sponsor workshops, programs for young people, scholarships, and a variety of special events. Our auxiliary organization, the Lyric Krewe sponsors its programs and events as well. In addition to the programs sponsored by TCT and the Guild, we participate in our state, regional and national community theatre associations, which maintain excellent programs for the advancement of theatre. 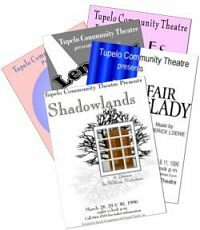 These pages offer information on all of these programs and associations, as well as information on purchasing season tickets and becoming a member of TCT. Oh -- we almost forgot -- this website is a one of our programs too!